+$To say goodbye to 2016, Spotify has turned user details into a series of funny billboard adverts. +$Created by Spotify's in house team, the campaign is appropriately named 'Thanks 2016, it's been weird". The data-driven ads are made up of posters that rely on some of the more unusual facts and figures related to the digital music service. These include playlists with odd names, plus stats that relate to specific events such as holidays. 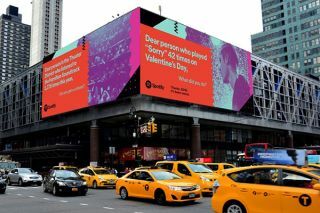 +$"There has been some debate about whether big data is muting creativity in marketing, but we have turned that on its head," says Spotify CMO Seth Farbman. "For us, data inspires and gives an insight into the emotion that people are expressing. +$"It has the ability to really drive clever copy home that other media can't always do as well," he adds. +$Explore the witty ads below, and who knows, maybe you'll see a billboard related to you in the future?